The Rijksmuseum restaurant is a bit ritzy for some tastes; the Van Gogh Museum's in-house café is more suited for casual bites. If you want a more memorable meal after museum-hopping, choose from these restaurants near the Rijksmuseum and Van Gogh Museum in Amsterdam. Besides these recommendations, the streets just south of the Vondelpark are full of worthwhile restaurants, so don't be afraid to see where luck leads you. The owners of these two restaurants probably wouldn't appreciate my lumping them together. But the menus (both dubbed "International") are similar enough to recommend either for a delicious meal in a cozy setting. They also happen to be right next to each other. Both keep it simple for lunch, serving sandwiches, soups, and salads. Dinner selections include classic and inventive meats, fish and pasta. Outdoor seating at either affords ideal neighborhood people-watching. 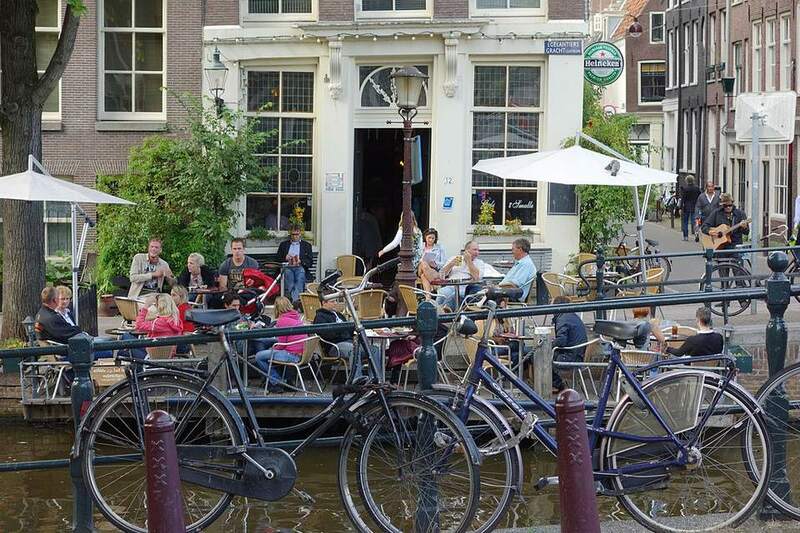 While tourist crowds converge on the fast-food stalls on Museumplein, head south through residential Museum Quarter area to find this locals' favorite eetcafé. Waiting for a table is inevitable (they don't take reservations), but once you taste their signature dish, my pick for the best steak in the city, you'll agree the wait was worth it. This is one of Amsterdam's longest established and most popular Indonesian restaurants, so book ahead to get a table. If you choose a traditional rijsttafel (literally "rice table," a selection of 15-20 small dishes served with rice), you might need a nap afterward! Open for lunch and dinner. The terrace at this neighborhood café is packed on sunny days, thanks to its southern orientation. Lovers of Art Deco style will marvel at the interior, although some may find it run-down. Whatever your opinion, the menu is full of variety and reasonable prices, from a burger on pita bread (served with lots of frites, of course) to huge salads with spicy Thai chicken or smoked salmon. This old-fashioned Dutch restaurant is a veritable institution in the Old South, where diners tuck into daily specials amid a cozy, wood-paneled interior. The menu combines both the freshest seasonal fare with all-weather Dutch classics, and prices are famously rock-bottom; after all, this has been the local address for hearty Dutch food since 1935, and it's a perfect spot to make a first acquaintance with typical Dutch cuisine. Note that it's open on weekdays only and limited to dinner; the kitchen closes at 8:30 p.m., but you can sit down for dinner as early as 4:30 p.m. Updated by Kristen de Joseph.